Our traditional family Christmas Breakfast at my moms' house was over and everyone headed back home in the early afternoon. This Christmas Day was a little warmer than usual and the promised Snow Showers had somehow managed to miss us altogether, again. What to do with the couple hours of available daylight? Jill decided she was going to make some homemade bread and I was "Open". So I grabbed a detector and hopped in the old Tacoma and went for a drive to a little spot I know. I needed to get out and swing a detector. The area is older and has mid-1800's potential. Today it just looks like some sagebrush and dirt. I hopped out of the truck and was glad I had on my winter jacket, hat and gloves as there was a bit of a breeze moving the air over the snow covered ground. The dirt was hard and frozen under my feet. Before putting on my recovery pouch I walked around to where the sun had been hitting a slight hill and had melted away most of the snow leaving the bare dirt behind. The soft lumpy dirt gave way under my boots as I walked around the area. We're good. I fired up the detector and started methodically sweeping over the ground. Within a minute I had a high Bing in my headphones and a solid Target ID to go with it. High Penny / clad dime area, 4-5 inches deep. A quick shovel and the target was on the bottom of the plug. A square piece of aluminum with a couple holes in it. There was a pattern around the edge. Looks like the edges had been shaved away on opposite corner making points. There was some writing showing Good For 10¢. Wow, a token just a few minutes into a hunt. I kept on going. Plenty of .22 casings reading unusually high in the pull tab region and related lead bullets. 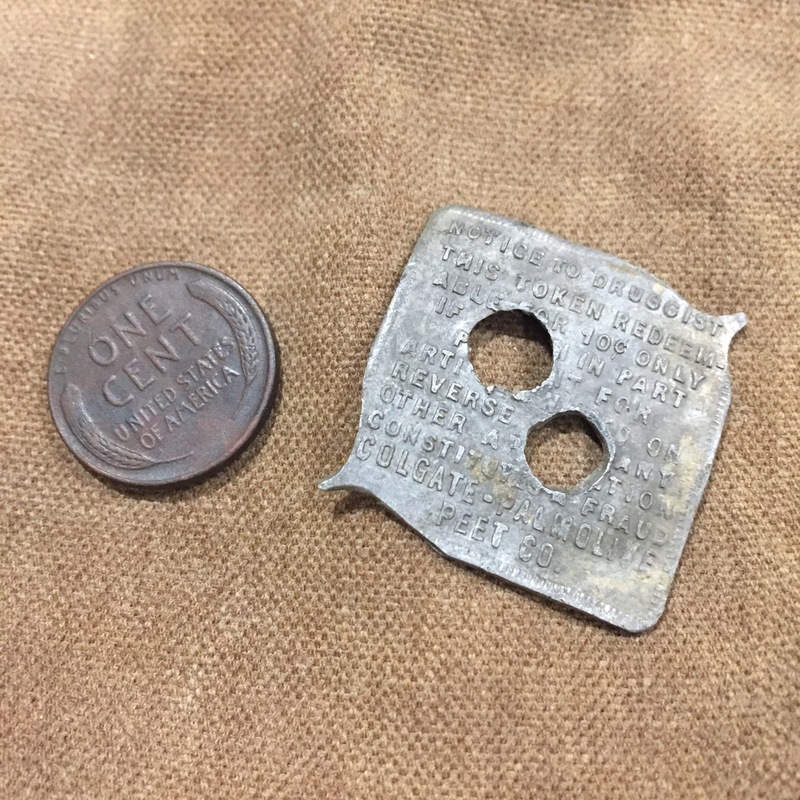 Even found a couple pull tabs reading where they normally do. Then another high penny type signal and up popped a wheatie from 5-6" deep. Pretty good shape. 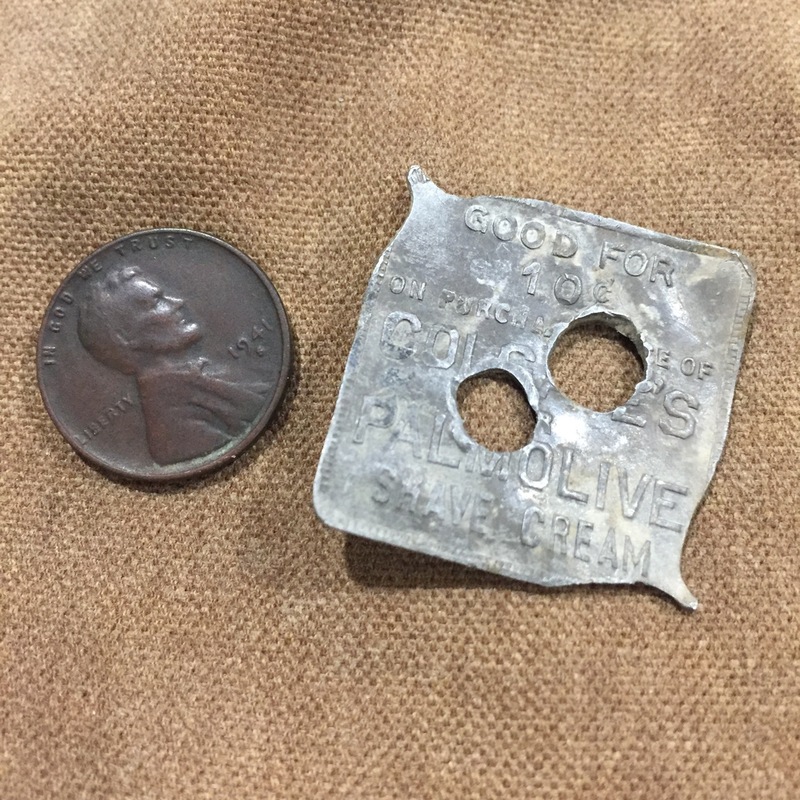 1941-S. A brass shotgun shell base in 20 gauge popped up. More .22 casings and a couple aluminum screw caps and then just like that the sun was setting. Time to head home for some of that warm bread. It was good to get out. Glad I've been keeping an eye out for South facing spots. If any of you have particulars on the modification to the token, I'm eager to hear. I've seen similar holed tokens used as a weight with a loop of string between the hands. The weight is spun first one way then reversed the other by moving the hands apart and then back together at the weight winds up the string. Not sure why the opposite corners of this would be whittled away though. Hope all of you are enjoying the Holidays. I think you just made me feel a lot older. Whizzers, Warm bread, and getting out to hunt. Remfire is a real whiz .